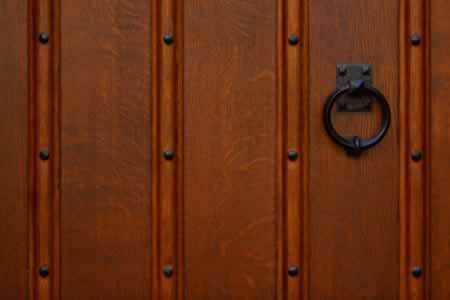 It's easy to see that custom doors can make the most out of fine wood and period hardware to complement your home. There's no substitute for the warmth and charm of natural wood. The patterns and natural grain in this custom door cannot be perfectly duplicated. Decorative strips, molding, and clavos echo the superior European designs made for centuries by craftsmen skilled in detail work and expert joinery. To complete the custom, historically accurate look for your one-of-a-kind entry, choose reproduction or historical-salvage knobs, knockers, and hinges that contrast with the rich hues of your hardwood. Ask your installer about completing the project with high-performance weather-stripping and modern security locks. And always protect your investment with professionally applied sealants and stains.